People living with HIV are still being considered “dead” by many in our society; they think of PLHIV as people waiting for death to come. However, we already know that PLHIV can live a life in its fullness if support and medications are provided in abundance and are easily accessed. Then and now, the struggles of PLHIV in the Philippines are rooted in stigma, shame, and discrimination in various forms. Most of them are institutionalized and ingrained in the country’s poor sexual and health education and difficulty in accessing testing and treatment. This year is the 30th World AIDS Day celebration. The theme of UNAIDS is “Know Your Status,” and that of the Philippine government is “Saving Lives through Leadership and Partnerships.” Both themes are important in our collective work towards a society that is not just free of HIV & AIDS but also a society that is ready to welcome and accommodate PLHIV and their needs in health services. 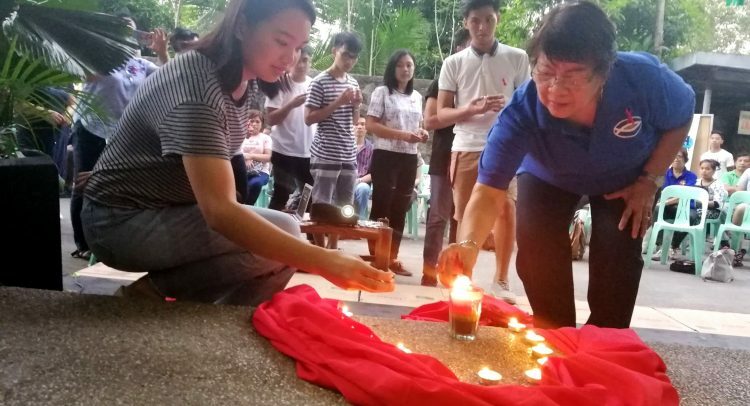 The National Council of Churches in the Philippines is grounded in the theology that PLHIV are created in the image of God and that God loves them no less. PLHIV who are empowered have a great capacity in advocating for change in our health system and in healing the ills in our society. They are the direct beneficiaries of our ministry. Thus, they bring new perspectives in strengthening our work because this is their experience. NCCP, together with churches and partner organizations, continues to empower PLHIV and the most vulnerable to HIV & AIDS – women, youth and children – through education and access to voluntary testing and treatment. NCCP remains in solidarity with PLHIV and their loved ones. Our task is to take away the stone of stigma and prejudice. And if PLHIV publicly come out as positive, together we must take off the grave clothes of fear with which society has covered them, so that they can live a full life just as everyone else. We must find the causes of stigma and shame, discrimination, denial, inaction and misaction in our churches and institutions. As we commemorate World AIDS Day, we commend all those in this mission – the human rights activists and health advocates, for their love, support and commitment. We honor our predecessors for lighting up a path that we follow today. May we continue to create compassionate and caring churches and communities for everyone, not least to PLHIV.